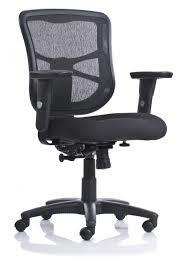 Task chairs are by far the most common type of office chair. They are generally used at an office desk and for many different purposes. 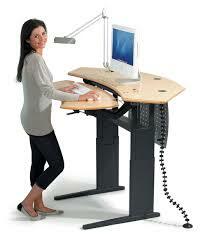 They typically come with many types of adjustments ranging from simple up/down through more ergonomic options. Task chairs can be found in nearly every color, mesh or fabric backs, and mid or tall backs. Tasks chairs swivel and come on wheels for easy maneuvering. 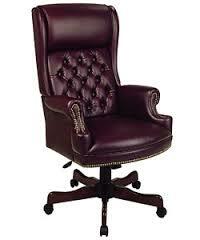 Executive office chairs don't need much explaining. They are simply the cadilac of office chairs. Typically built with high quality leather and made to last, these chairs are pricey yet also a good value. And with various intricate details, you'll know whoever is sitting in it appreciates aethetics. Conference chairs have to serve many different purposes. First, they need to look professional and attractive since the will likely be serving guests over and over again. Second, the comfort needs to hold up to those long board meetings that can last hours. Finally, they will get used and abused and so need to be durable. 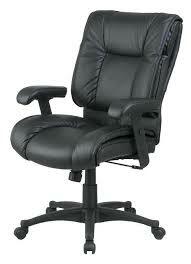 Because of these factors, you often find leather-backed conference chairs with many adjustable components. While not the most common in the workplace, lounge chairs can make quite the first impression. 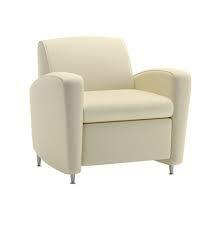 In fact, lounge chairs are often the first thing a visitor sees (or sits in!). They uphold the style of your office and welcome visitors with comfort. They're also useful for employee "hangout" spots around the office which facilitate employee communication. Lounge couches can also be thrown into this category. 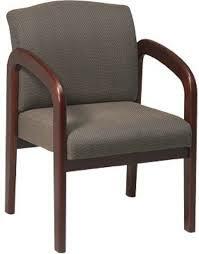 Guest chairs are most common in industries where live presentations are happening in someones office. This ranges from a doctors office (where a patients significant other may be sitting) to financial advisors, real estate firms, and many more. You need some simple and convenient yet impressive to potential clients and customers. Stackable chairs are actually not quite as simple as they appear. 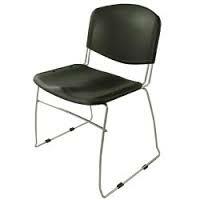 In fact, stackable chairs come in a variety of materials including wood, steel, vinyl, metal, fabric, and more. They also range from economy (your average backyard cookout chair) to upscale used for luxurious office settings. Today, nearly every type of office chair has a stackable version. 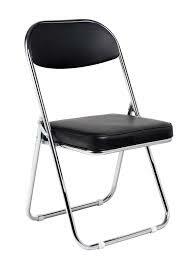 Folding chairs are the least formal of the bunch yet similar to stackable chairs, they are increasing in their variety. They range from simple metal folding chairs, to heavily cushoned with fabric and even with covers that can be used for weddings, conferences, or other events. They are typically light weight and easy to transport. Perfect for extra conference room seating, pop-up activities, and more. Likely the most self-explantory chair there is! In short, cafeteria chairs warrant something that is light, easy to clean (meaning typically no fabric or leather), easy to move, and doesn't always need a strong comfort factor since time is limited in them. 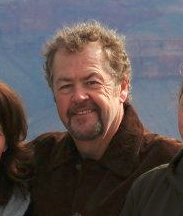 Color is often a big deciding factor here. While the chairs listed above still dominate the industry, that doesn't mean there aren't new types being introduced. 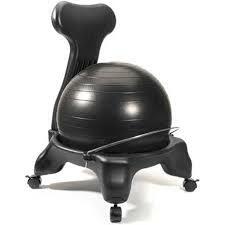 For example, sitting on a medicine ball as a chair has evolved into something like you can see to the right. 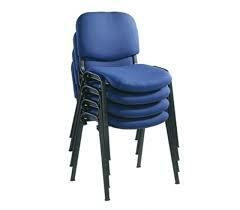 There are now many typies of egonomic chairs like this on the market. One of the biggest recent trends is not to use a chair at all! It began with "stool" chairs that could be raised quite high to accomodate tall desks that one could stand at. However, these fixed desks have now evolved into motorized ones that can be listed with the click of a button. The benefits of standing are incredible and no chair at all might just be your solution.